The interior design of washroom is very important, because it is a very delicate room, so, it should be comfortable and pleasant to be in it. Luxury Antonovich Design Company can easily create a project of a presentable washroom, which perfectly fulfills all its functions and completely complement any place. — Wishes of the customer. Our clients can offer their own tastes for decoration, fit-out materials or furniture. Our task is to come to an agreement and productive fit-out work aimed at the result. Classic design is preferred by established people who do not need proof of their significance. They honor traditions and respect family values. Therefore, to create an interior and decoration of the washroom in classic style, our designers by Luxury Antonovich Design focused on fit-out. The end result of the interior depends on how the fit-out materials are chosen for the walls and the floor. 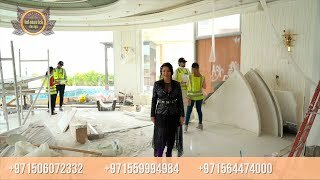 Our designers select only high quality natural marble and gypsum, as well as complemented the interior with figured furniture with oriental elements and diffused light. In the interior of this washroom the details of the classic curtains of golden palette with lambrequins and pendants, and a beautiful mirror in a carved frame perfectly complement the interior picture. The modern design of the classic washroom by Luxury Antonovich Design turned out to be functional and conceptually containing the general style concept of the house, a comfortable corner, a delicate and relaxing place. The abundance of glossy surface strengthens the comfort of the washroom. A pleasant and soft feeling of comfort is created by fresh flowers, terry towels, candles, original furniture of a rich shade. A special place is occupied by the light elements, which create the dominant structure of illumination and highlight the main mirror elements. The color combination of space is selected to underline the zone. The bathroom is decorated in golden beige tones. This combination is used both in the decoration of the walls and in the plumbing and accessories. Golden metal on a background of beige marble tiles with a floral pattern is a favorite technique of modern classics.